This has been a good year for fall color in Minnesota, since the oaks and maples have both gone off at about the same time. I suppose that's an effect of the drought, but it's pretty. 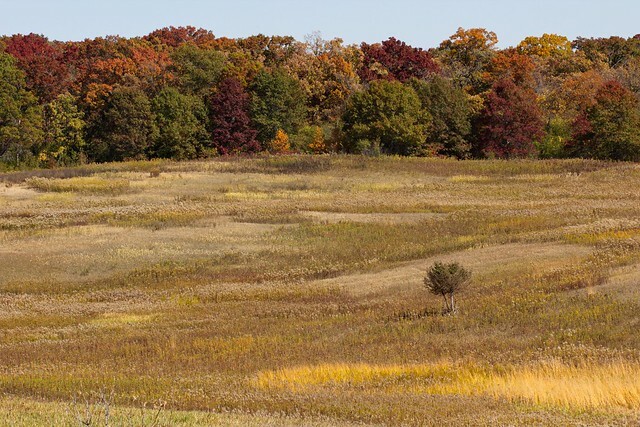 I took this photo from a hilltop at Murphy-Hanrehan with a panoramic view of prairie restoration ringed by trees. I'm no longer willing to change to a wider lens in the field because I have enough dust on my sensor already, so I looked for an interesting slice that the 100mm macro lens could capture.